This past Saturday, our family did the October outing -- a day at the farm. 3 farms to be exact, traipsing through 2 pumpkin patches, picking our own corn and spending some time at the baby animal petting zoo. The last time we went, the aromas from the concession stands were almost overwhelming. 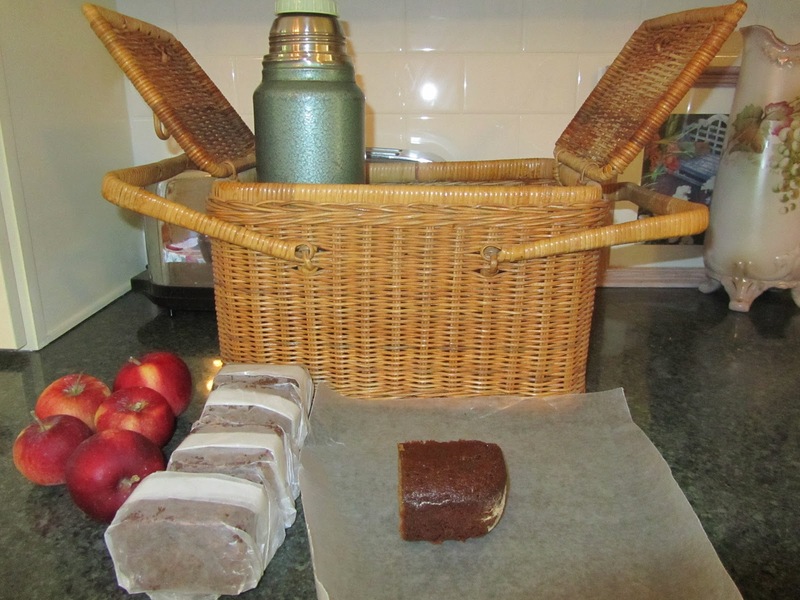 This time, after a hearty oatmeal breakfast for all, we brought gingerbread cake squares, apples from our trees and hot spiced apple cider, to enjoy throughout the day. I still would've really enjoyed a bowl of chili at one of the farms, but for $6.75 a bowl, no thanks! So, packed into the car, we drove north to a farming community. We only visited 3 of the farms. There are many, many more. 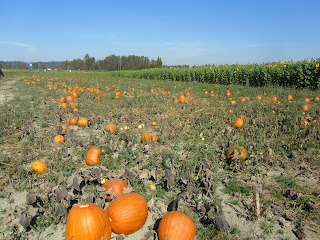 But after looking at pumpkins for a couple of hours, we really had no inclination to press on in the pumpkin patches. We found the u-pick corn farm that we had visited two years ago. Corn prices are higher this year. Back then we paid 20c per ear. This year the price was up to 25c. But considering what happened in the mid-west with their corn crop, I can hardly complain. We enjoyed our own version of the free corn maze -- getting lost in the u-pick field. We went deep into the field to find the largest ears (the big ears near the entrance had already been picked off). And followed up by Marco Polo-ing our way back out. We bought 16 ears of corn. I've been wanting to make some corn salsa. I've never made any before, but will give it a try this week. Our local Mucho Burrito has corn salsa as one of their options, and I love the stuff! I also bought a small squash for 75c. I should have bought more, given that it was such a bargain, but I had to carry it around for a while, and that's all I wanted in my arms. Pumpkin prices are almost always higher at the pumpkin patches, than the grocery stores. So we go and enjoy oohing and aahing over the pumpkins in the fresh air, then, back in our own community we buy our pumpkins for about 1/3 less. Planning our snacks was a big help. We neither had to go hungry, nor did we succumb to the overpriced treats there. A small 8 oz. bag of candy corn was selling for $3.99! I saw many families with bags of caramel corn. In hindsight, I wish I'd brought something more substantial to snack on, in addition to the treats we did bring. That chili really got to me, I guess. One of the farms had a money-sucking gift shop. Interesting to look through, and surprising to see all the folks shelling out big bucks for things like a 2-cup bag of acorns for $10. Anyone with oak trees nearby will be laughing themselves silly over that one. 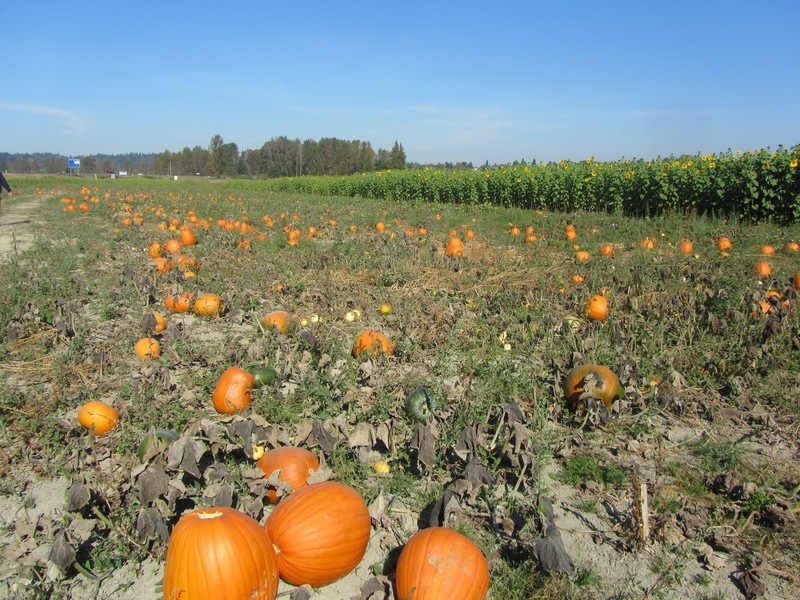 These pumpkin patches offer corn mazes (about $8 per person), hay rides (sometimes free, but the ones we saw were $3.50 per person), pumpkin launching (a couple of dollars per pumpkin), and food concessions galore. I get it -- they are money-making enterprises. But in hindsight, I'd have thought all this through before going. Maybe (but just maybe, I'm not sure we'd have all that much more fun, by doing the "extras") I'd have set aside $15-20 cash to spend -- when the money's gone, so are we, sort of thing. And I'd have brought more to eat with us. Even if we'd stopped in at the grocery store deli and bought some fried chicken to take with us, that would have cost a fraction of what they were charging (and I wouldn't have longed for that chili). But in the end, I queried my husband and kids about the day, and even without spending on the "extras", we all had a great time. Picking corn was a highlight for several of us. One of my daughters said she liked the gift shop (okay, she's a teenager, she likes to shop, even in a store filled with overpriced acorns!). And being outside on a lovely fall day was a treat for all of us. Will you be visiting any pumpkin patches this month? I have been thinking about going to one of the big corn mazes. I get lost when you turn me around in a hallway, so it would be a challenge for me. And it would certainly take me out of my comfort zone. Something I am trying to do more of. However, I wouldn't go without my husband (who has an excellent sense of direction) because otherwise, I would be there until they closed otherwise lost in the maze. Also, was the corn eating corn or field corn? Our eating corn has been gone for a while. I would love some right about now. now that would be a challenge for you, but a lot of fun, too! Have a great time , if you decide to go. The corn was eating corn, and it was so sweet. Here in the Seattle area, we have a cooler and slower warm up to summer (and relatively cool summers once it does warm up), so a lot of crops are much later than other parts of the US. I don't see many pumpkins growing in our area. 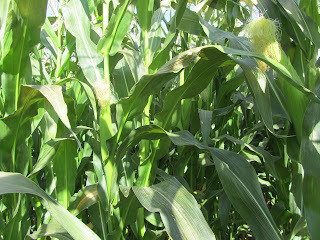 (We do have corn mazes though -- but they are in field corn.) However, we do end up with several large pumpkin "lots" in the town where son lives. That is an unbelievable price for a bowl of chili...wow! You'll have to make some this week to satisfy the craving. I heard that in some areas, due to the crazy weather this summer, the pumpkins all ripened over a month ago. My kids watched the Charlie Brown Halloween special the other day--when I read your post, all I could think of was which pumpkin patch will the Great Pumpkin find to be the most sincere? It sounds like a wonderful day ... and as you so often say (and your regular readers agree), the amount of money you spend doesn't necessarily dictate how much fun you have! I kept thinking about the Great Pumpkin. I loved that special when I was a kid. Does it seem shorter to you now? I always remembered it being longer. I heard on the news, last night, that apple juice/cider is more than gas in some places. I found apple juice on sale at our grocery store for $1.66 a half gallon. The apple crop in Washington state did fine this year. Maybe that will help even out prices a bit on frozen concentrate at least. Even so, I do things to stretch the apple juice. First of all, we only use half the container per week or so. I pour out half into a pitcher, and freeze the other half in the plastic jug. Then if I'm turning it into hot spiced cider, I simmer cinnamon and cloves in about 1 cup of water, then add the juice when the spiced water is ready, and only briefly heat (to preserve the vit. C). I taste it, and if it's a bit too spicy, I add some water and a bit of sugar as needed. If we're just drinking the apple juice cold, I always add about 1/2 cup of water to a quart of juice. I think apple juice is too sweet as is, and this makes the juice I buy last longer. I bought apple juice concentrate for 99 cents/can last week, but I'm really wanting cider. We don't drink a lot of juice any more--I'm trying to encourage more whole fruits--but sometimes it's a treat for the kids. We have a video player as well. We still have some videos that we like to watch from time to time, so will hang on to the player as long as those videos last. No, I'm not going to any of the pumpkin farms this year. It's too wet and cold for me and the kids are grown and can take their own children. I did purchase my pumpkin from the farmers market and it was much less expensive than at the local stores. I purchased mine for $1. The stores are charging $5.99 for the same size. Our pumpkin farms are much less expensive for the pumpkins than the stores every year. I hate when people gouge you on the cost of food at these kind of events. It's crazy. The one farm we used to go to every year was amazing. Everything to do was free, and the food prices were reasonable. A slice of home made pie was $1.50 and hot cider or hot chocolate was 75 cents. But they are no longer in business. Glad you were able to enjoy yourselves. The farm you used to go to sounds great. It's a shame it's no longer in business. I do remember not too long ago, most farms in our area offered free hay rides. Couldn't find a free one this year, though. But we had a lot of fun anyways. When you can't grow corn to save your life, picking it at the farm is a real adventure. Great to read about your day out, as we don't have any pumpkin patches over here. Sounds like the cost to fun ratio was very acceptable to me! I like that phrase "cost to fun ratio". It's a very good way to put it. We can have all sorts of fun at an amusement park (and spend loads of money), but the ratio might not be as favorable! I really want to go apple picking and check out a corn maze! 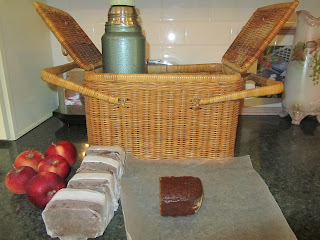 Someone told me about a good place to go for the apples... time for some pies and an apple cinnamon quick bread. :) I keep seeing groupons for really cool fall deals, like haunted hay rides/haunted ski chair lifts, corn mazes, etc, but most of them end up being super far away (1 hour plus) so the deals don't really count to me if you have to go that far! Soon! Maybe today or tomorrow! I hope you get a chance to go apple picking or to a corn maze soon. All those pies, yum, yum, yum!